Kal Alston has been named interim executive director of the Community Folk Art Center (CFAC) for the rest of the 2016-17 academic year, according to a recent statement by Karin Ruhlandt, dean of the College of Arts and Sciences.Ruhlandt made the announcement after conferring with Bea González G’04, dean of University College and a special assistant to the chancellor; CFAC’s board of directors; and members of the Department of African American Studies (AAS), with which CFAC is an academic partner. Alston succeeds Kheli Willets ’92, G’94, G’02, who oversaw CFAC for more than 14 years, before becoming CEO of the Houston Museum of African American Culture. “I will miss Kheli Willet’s leadership and dynamism, but I look forward to working closely with CFAC’s talented staff, with my colleagues in AAS and A&S and with CFAC’s board to engage students, artists and institutions in and beyond our region in inspirational and generative expressions of culture and arts from the African diaspora,” says Alston, who is a professor of Cultural Foundations of Education in the School of Education and a faculty affiliate in women’s & gender studies in A&S. Founded in 1972 as a launching pad for African diaspora artists, CFAC has evolved into a crucible for various groups, including Latino, Native American and female artists. The center offers exhibitions and artist talks; annual signature events, such as the Caribbean Cinematic Festival, A Journey Through the Music of the African Diaspora and the Jazz and Wine festival; and classes and workshops in art, dance and movement. CFAC also is home to the Creative Arts Academy, a tuition-free after-school program for students in grades 7-12, providing personalized and group instruction in dance, drama and the visual arts, as well as academic tutoring from Syracuse faculty and area professionals. Alston describes CFAC as a “key connector” of Syracuse students, faculty and staff, as well as communities of color. “CFAC’s long history of exhibitions, performances, demonstrations and collective action provides a strong foundation for launching the next phase of the center,” she says. Located on Genesee Street, near Syracuse Stage, CFAC will mark its 45th anniversary next year. Since joining the University in 2005, Alston has excelled as a teacher-scholar and an administrator. 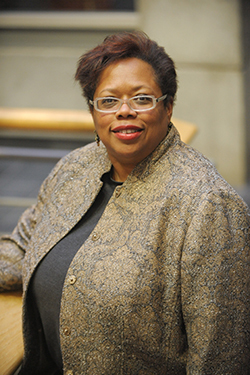 In addition to her faculty appointments, she has served as the University’s senior vice president of human capital development and as senior associate provost and associate provost of academic administration. Alston particularly is interested in the philosophy and social foundations of education (with emphasis on race and gender), as evidenced by her dozens of published articles and book chapters and her many lectures throughout North America. A former professor at the University of Illinois at Urbana-Champaign, she earned a Ph.D. from the University of Chicago.